The U.S. Chemical Safety Board (CSB) has released its final report into the August 28, 2016, nitrous oxide explosion at the Airgas manufacturing facility in Cantonment, Florida. 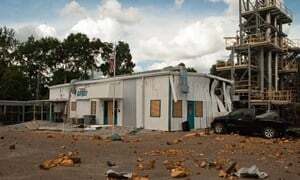 The blast killed the only Airgas employee working at the facility that day and heavily damaged the plant, halting its manufacturing of nitrous oxide indefinitely. The CSB investigation found that federal regulations require some chemical facilities that manufacture hazardous substances to have process safety management systems in place to protect their workforce and the public. The CSB discovered, however, that a majority of these specialized rules are not required for nitrous oxide facilities. Safeguards installed by the company, including the safety interlock to automatically shut down the pump, and flame arrestors were likely ineffective, and failed to prevent the incident. The Airgas Cantonment facility is one of four manufacturing plants in the United States producing nitrous oxide for industrial facilities, hospitals, and universities. The Airgas process includes pumping liquid nitrous oxide from storage tanks into trailer trucks or shipping containers, which deliver the product nationwide. On the day of the explosion, the Airgas operator likely began the transfer process. Under normal operating conditions, nitrous oxide is stable and can be safely handled; however, under certain conditions it can decompose explosively. CSB investigators found that a pump used to transfer nitrous oxide into a trailer heated the gas above its safe operating limit and triggered a violent decomposition reaction. The reaction migrated from the pump into the trailer causing the explosion. The explosion scattered large metal fragments for hundreds of feet, damaged the facility, and killed the Airgas operator. As a result of its investigation, the CSB issued safety recommendations to Airgas, the Compressed Gas Association, and to two nitrous oxide pump manufacturers. The recommendations include the development and implementation of a safety management system standard for nitrous oxide manufacturing as well as the distribution of increased warnings about nitrous oxide decomposition hazards. The Board does not issue citations or fines but does make safety recommendations to plants, industry organizations, labor groups, and regulatory agencies such as OSHA and EPA. Visit our website, www.csb.gov. For more information, contact Communications Manager Hillary Cohen, cell 202-446-8094 or email public@csb.gov.